Quick note: I stopped in back on October 25 to put away the pop-up camper, but that was such a flying trip that it didn’t seem to merit a log entry. Drove up with Hannah a little after 10:00 am with all sorts of electrical goodies in the back of the truck. Dad was already here with Jake, who had slept over at their house last night. Also with them was Dad’s brother Cal, a professional electrician. He was here to supervise and give me a hand as I made some much-needed upgrades to power supply here. 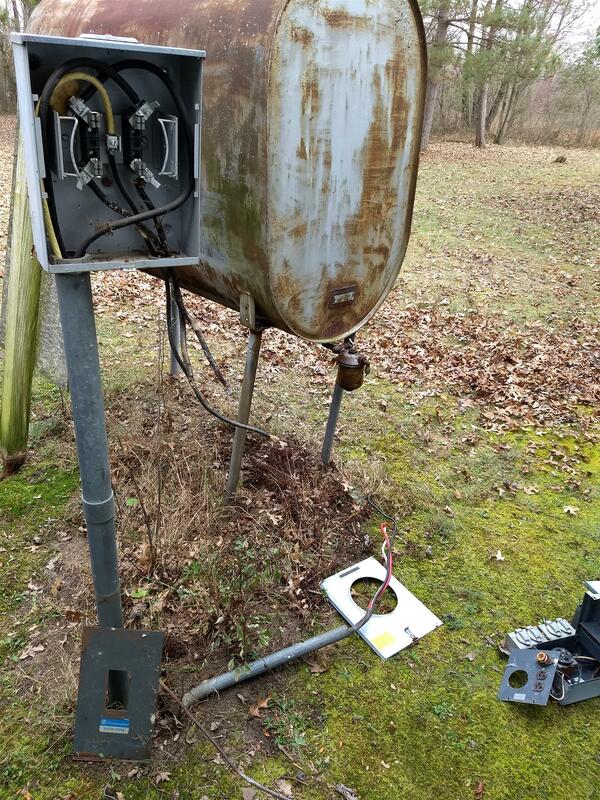 Our main outdoor service panel is in rough shape. It’s an ancient 60A “Pushmatic” affair with very reluctant breakers and it’s mounted to a rotten plywood board on an equally rotten 4×4 post. I think the only reason it still (mostly) works is that it can’t decide whether to fall over or catch on fire. 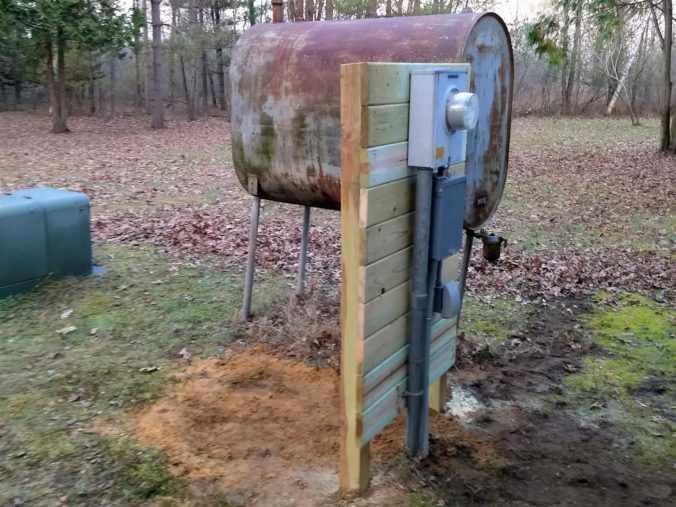 Especially since the strange electrical problems we experienced last year at deer camp, I’ve been getting after Dad to talk to an electrician about upgrading the panel. Well, he talked to two of them. His friend Nick helped us pick out proper replacement parts, and now Uncle Cal was going to help me make the swap. Steve and Sam pulled in while Cal and I were going over our plan. They spent the day scoping out their stands and the marsh trails and working with Dad on getting the big trailer ready for deer camp. Jake went between playing with Hannah, helping the guys out, and checking out our electrical progress from a safe distance. 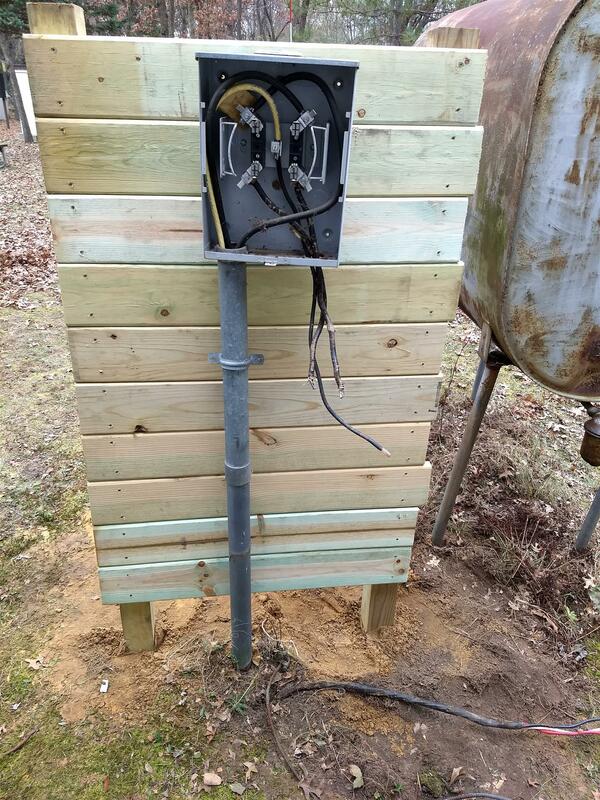 I initially thought we’d have to involve the power company to shut off the service at the transformer box so it’d be safe for us to mess around with the supply wiring, but it turns out we had a semi-safe way around this. We opened the meter box and just pulled the meter assembly right out. It’s just got six stab connectors to bridge the two hot and one neutral connection between the service and the supply, so it’s like pulling out a big fuse. 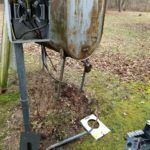 Now everything downstream of the meter box (which itself is relatively new and rated for 200A) was dead and safe to work with. It’s time to do wrong right. We opened the Pushmatic panel and disconnected the supply wiring and the run to the big trailer. 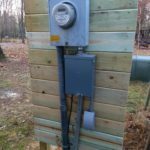 Once we delicately fished these heavy-gauge, rigid wires through the short runs of conduit and fittings, we were able to throw out the ancient panel and outdoor outlets. 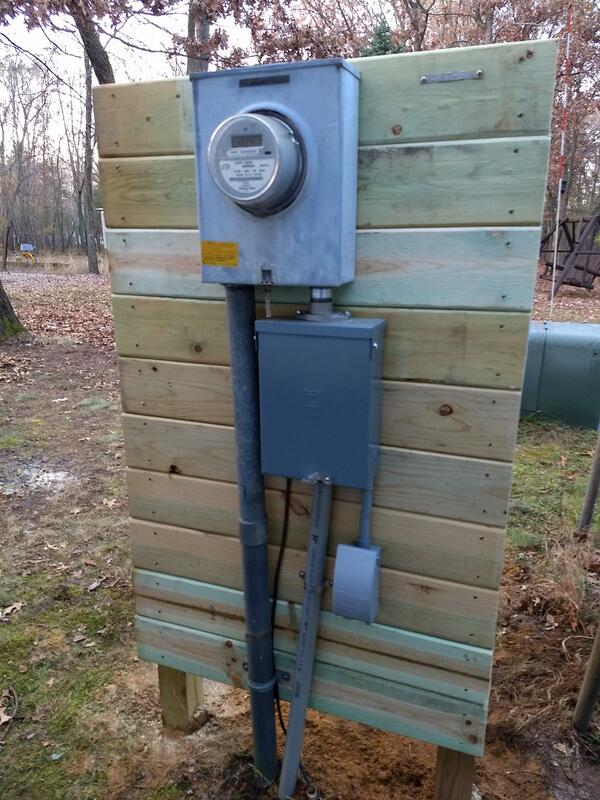 Now the meter box was the only thing attached to the old plywood board. It was fed by some big, solid conduit, so we weren’t worried about having to temporarily support it at all. I unscrewed the box and the board and post fell over immediately. 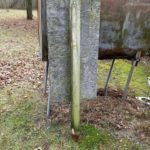 The post was rotted-through at ground level. Apparently that meter box was the only thing holding the whole setup together. Wow. I dug two holes with the blue ice auger and Cal got a kick out of both my choice of tool and how quickly and easily I was able to dig in the sandy soil. 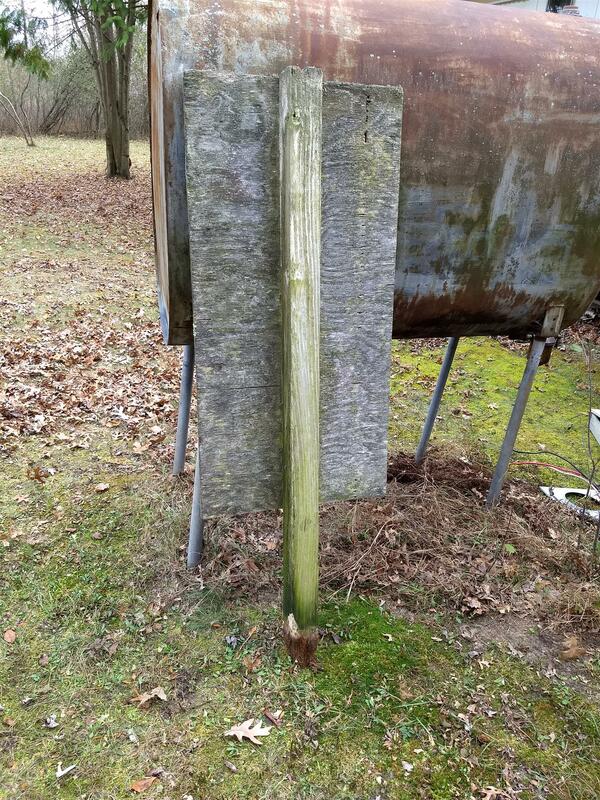 We stood up two pressure-treated, ground-contact-rated 4×4 posts and got them plumbed. I then sawed five 6′ treated deck planks in half and started screwing them into the posts. 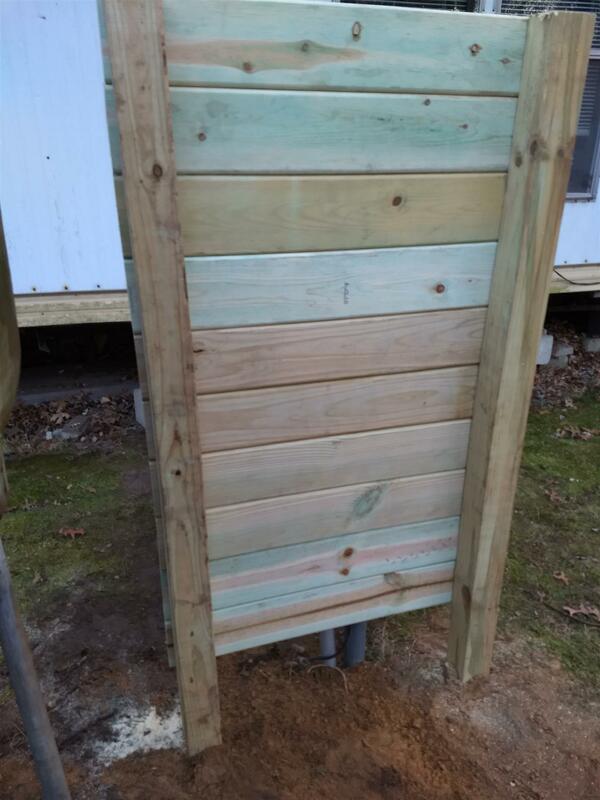 Before long, we had a sturdy new support for our outdoor service panel that should hold up to the elements quite a bit better than the last one. I also drove an 8′ grounding rod into the, uh, ground. This was placed six feet away from the current one and we joined them with 6-gauge cable and proper lugs. Again, we’re here to do wrong right. The post was apparently decorative, not functional. We just built right up to the box. Now that we had something to anchor everything to, it was time to start wiring up our new parts. 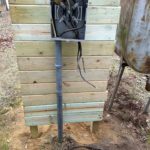 However, we ran into a snag when we found the conduit and fittings that were between the meter box and Pushmatic weren’t going to work with our new load center. Road trip! Cal, Jake, and I made a quick trip to Kitz & Pfeil in Berlin to get the right stuff. We also picked up some PVC conduit to protect the feed to the big trailer from the bottom of the load center to the ground. We got back to camp around 1:00. Steve and Sam had gone home. We got right to work feeding the wiring from the meter box to the load center with our new fittings. Once everything was tightened down, I carefully screwed the meter box and load center to the deck planks. With this in place, we fed the big trailer feed through a length of conduit and into our load center, hooking it up to a 100A breaker. We were now ready to test our connection, so Cal very carefully lined up the meter with its mounting posts. When that didn’t cause an explosion or series of wild arcs, we securely installed it and flipped our new breaker. Again, no pyrotechnics. The big trailer, keep, and pole barn all had their power back. Success! Here’s what’s hiding under those waterproof covers. 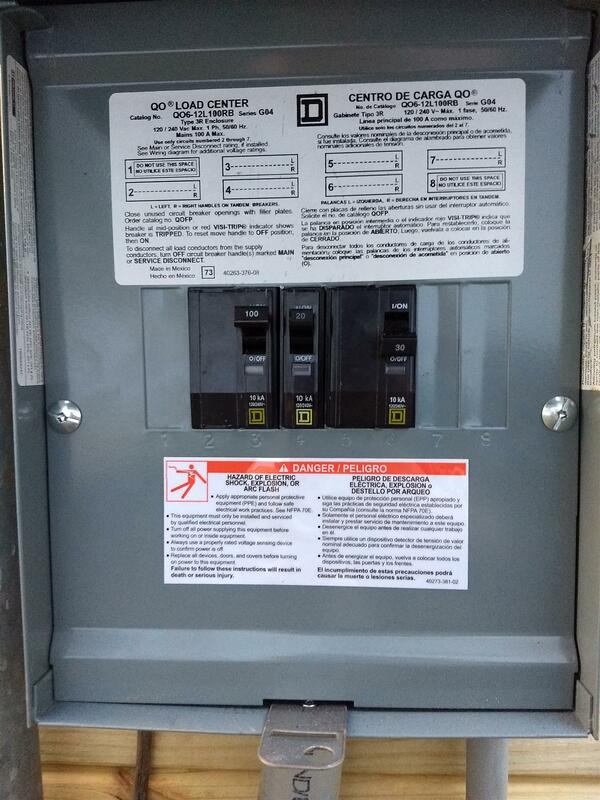 We closed up the meter box, put our 30A dual and 20A single breakers in the load center and installed the cover. 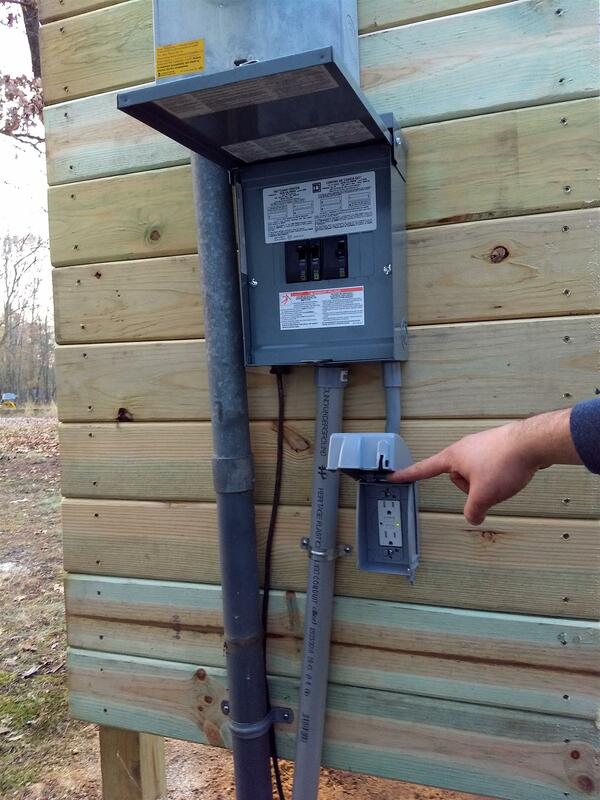 The 30A breaker will eventually feed the pole barn directly and let us use some 240V goodies out there. 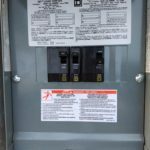 The 20A breaker is just to give us some outdoor outlets at the service panel. With the scary work done, Cal had to get going home. But when Dad went to start his truck, nothing happened. We tried jumping it with no success either. Seems like his starter just decided to give out. The Lord of Electricity giveth, and the Lord of Electricity taketh away. They ended up using my truck so Dad could get Cal dropped off and then swing back to catch a ride home with me, Jake, and Hannah. It’s even pretty from the back. While they were out, I got Jake set up in the keep with a movie. I had the heater going for him and he was covered in blankets. He looked pretty comfy in there and Hannah was content to keep him company on the couch. 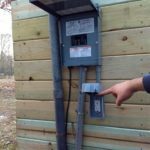 I headed back out to install the outdoor outlet on the new panel and clean up the job-site mess. I left all my tools stacked next to Dad’s truck so we could throw them in the back of mine when he got back. By the time I finished up it was 4:00 and already getting dark. I had promised Jake that he could help me mow, though, so I got him bundled up again. We got on the tractor together and made a few mulching runs up and down the driveway and around the front of the keep. When it got dark enough that we actually needed the mower’s headlights, I called it a night and we parked it in the pole barn. Back in the keep, I made us a pizza and installed the storm windows while Jake warmed up on the couch and Hannah slept on the floor. Dad pulled in a little after 5:00 and we were off. I really like how the new panel turned out and what it means for future projects and expansions up here.